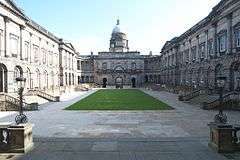 Universities Scotland was formed in 1992 as the Committee of Scottish Higher Education Principals (COSHEP) adopting its current name in 2000, when Universities UK was also formed. It represents 16 Universities and three other higher education institutions in Scotland. The Convener serves a two-year term of office. As of 2012, this post is held by Prof Pete Downes, principal of the University of Dundee. The director of the permanent staff is Alastair Sim. ↑ "Our Organisation: Universities Scotland". Universities UK. Retrieved 5 July 2014. ↑ "Universities Scotland: members". Universities Scotland. Retrieved 5 July 2014.